Success! That�s the theme of this post. Part of it is personal, but more it�s the success of the wider concept of the Matterhorn International Pro-Am. As I had noted in my previous post, I was concerned about having a �sophomore� slump for the tournament and overall it didn�t turn out that way as we had 31 people compete (compared to 34 in 2017). I was hoping to have a few more on the pro division, which is something we�ll work on for next year, but the competitive nature of that division made up for the lack of numbers. The morning starts early on Saturday versus a regular tournament day as I spend an additional 30 minutes making sure I have everything packed to run the tournament as well � computer, printer, things like that. Autumn (owner of the course) is providing some extra help this year on the administrative side which means we can get the score totals out quicker to the crowd. Since we haven�t moved fully electronic yet, and I know the suffering of waiting to see how you are doing, I�m cognizant of making those scores available as quickly as possible. This help is also great because my partner-in-crime Mandy has taken a job down in Washington, D.C. and with the furniture movers of course choosing tournament day to show up, is unable to make the trip back to help. I get to the course just as Autumn does and am met by Randy Rice, who just got in from NY, and his friend Danny Olejnik who I normally just see at the Maine tournament. Danny has tagged along and will try to learn the course in under an hour. It somehow pays off later in the day as he�ll end up shooting the tournament low of 37 and coming in second place � maybe practice is overrated! I get the administrative side set up quickly and work with the staff to take over registration, giving me a few minutes to practice and take a few pictures. Lack of media continues to haunt us at tournaments so it�s just another thing I add to my list of responsibilities for this tournament. It is a cool, but not cold, morning, a few degrees above needing a jacked or sweatshirt. Sweatshirt and short weather is my favorite in New England so I�m loving it. The sun is trying to come out and the course has people all over it. In my opinion, with weather like this, the morning of a tournament is one of the best time to be on a minigolf tournament. Everyone is in good spirits with the challenge of the day ahead of them and you can feel people getting excited. I practice some of the holes quickly and in retrospect I should have hit at least one shot on all 18 if possible before heading out to my first round. Regardless, I�m happy with the way I�m hitting the ball and ready to hit the course. I�m paired with Justin Seymour for the morning thanks to the computer randomly picking. We need a few more years to see if this will play out but it�s the second of two years where I was paired in the morning with the eventual winner of the tournament. Perhaps I�m good luck on this course? I�m off to an ok start with a 41-42-42 and I�m happy because it�s better than my morning last year. It won�t be good enough to lead the pack but I know I�m not out of it. I know part of the handful of dropped shots I have is due to worrying about how the rest of the players are getting along, especially our amateurs, and I�m not sure how anyone who both runs and plays tournaments can keep their focus on their putting. Justin ends up the leader in the clubhouse after watching Anna (his girlfriend) lead the pack after the first two rounds with some very good scores. I jump back into the clubhouse to tally the amateur winners and lo and behold we have a playoff for first! We get that done fairly quickly and hand out the amateur awards. Everyone seems very happy with how the morning went and at this point I�m 7th, only one stroke from third place. Another drawback to playing and running a tournament is lack of time. I shove some food in my mouth while getting things ready for the 4th round and just generally chatting with players. With the scores tight across the board there�s a bit of buzz in the air. Most of the pro players know each other well so there�s a healthy mix of competition and friendship. 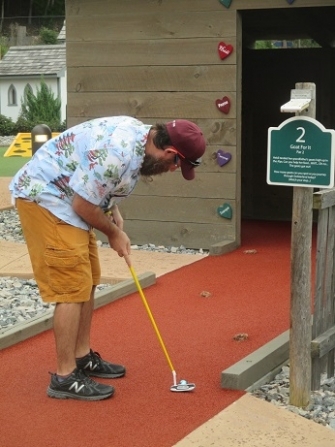 I�m happy to see that currently three of the top four places are held by relative newcomers to competitive minigolf. The 4th round turns everything on its head of course as the players ramp up their play. One of my goals at the end of the tournament was to do some statistical analysis of the scores. It�s interesting to see that in both years the average score for the pros dropped in round four and in 2018 the round five average was the lowest of the day, with also one of the smallest distributions between high and low scores among the players. It does seem to prove out that people are stepping it up when it comes to trying to finish in the money. I shoot my lowest round of the tournament in round 4 with a 39, in part because a lot of the pressure is now off. I only have the pros left and we�re all playing in a big pack so it�s easy to tell how things are going. It was the only round I�d play �clean� � no aces but only 3�s on the three holes you almost expect to take one � 7, 9 and 18. It�s good enough to put me in 4th, just one shot ahead of 5 people and one shot out of the tie for second. The fun part of that round was playing in the pack and watching someone like Danny, who had just seen that course that morning, get hot and since three aces while playing behind me and carding a tie for the tournament record of 37 (and the overall official course record for 2018 � the historical record is only a 36). Now it was time to just focus on playing. My big goal was to try to beat Danny and Steven, who I was playing with, because that would give me a shot at second place (narrator: it didn�t happen). What worried me more was losing ground to folks behind me, which meant I had to turn in a good score to force them to score even better. I felt good for the first two holes then stumbled and took a bad three on hole three. I continued to bumble a bit through the front nine and I ended up at the back of our pack at the turn and watching my hopes of moving up fade. I put the pressure on in the back playing �clean� but so did everyone else, which part of me was happy to see. It�s great when the top foursome finishes a tournament playing well. Justin was doing especially so, carding two aces on the front to solidify his lead and allow him to �walk up 18� as the winner. The local press got a great picture of me and Justin fistbumping after an ace and to me that picture says it all when it comes to miniature golf. My 40 was enough to hold the hounds at bay and I came in 4th for the second year in a row. In looking at my own stats it was interesting to see I did slightly worse in average this year and that I had more single hole blow ups (two 5�s) than in 2017, where I carded high scores because of dropping shots on multiple holes. Neither is good but not sure which is better! How did I do in my predictions? I�m glad you asked (I assume you did anyway). I had Justin as third in my favorite ranking so I wasn�t too far off but the field performed stronger than I anticipated. I cracked the top 4 and the winner averaged below 40 but it was the same score as last year. The ace winner did have more than 8 (ten actually) and there was playoff for the 7th playing spot. Overall I was pretty spot on with those predictions � once again proving that minigolf bookmaking is my true calling. Up next is the biggest tournament of the season, the USPMGA Master�s down in Myrtle Beach. It will be a family trip for me and I plan on having 3 full days of practice prior to the three day tournament. Last year was the first year I played and I�m looking to improve on 46th place. My biggest goal is improving on the Aloha course where I didn�t break 30 and overall my scores were about 2-3 strokes too high per round. I thought my Rumble scores were good but would like to see 1-2 more aces per round there. I�ll be blogging from the tournament as well so keep an eye out!